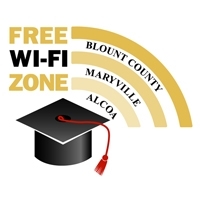 Blount County Schools, Maryville City Schools, Alcoa City Schools and the Blount Partnership have joined together to create a free Wi-Fi directory for students. This online directory provides a list of free Wi-Fi hotspots, sponsored by organizations and businesses in Blount County. The Free Wi-Fi Directory is available at www.blountchamber.com/community/freewifizone/ and also accessible from the school district and school websites. If you are a business owner or responsible for an organization that can provide internet access to all Blount County, Maryville and Alcoa students and their families, please CLICK HERE to add your business to our Wi-Fi directory. We will send you a 5 x 7 "free Wi-Fi" static cling (similar to the graphic above) to display in a prominent location at your business. STUDENTS: If a password is required at a location, please contact your school’s administration to acquire the password. 1618 E. Lamar Alexander Pkwy. CC Guest is our open network. 202 W. Lamar Alexander Pky. 7906 E. Lamar Alexander Pwy.